Concrete and steel may weigh as much, but nothing can rival stone for its beauty and durability. A stone builder must learn to evaluate each stone and undertake each step in the procedure with an eye towards aesthetics and useful permanence. 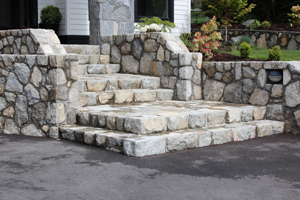 With this in mind Libral Furtado, the son of the founder of Victoria Landscaping Ltd. began to build and design 21st Century walls traditional stone building methods incorporating formulas for “Portland Cement” (originating in England in 1824). With the aid of Portland Cement it is possible to build taller and more substantial stonewall. While cement has some ability to “glue” the wall together, proper stone working techniques are more important. Building a freestanding stonewall is a true art and requires a lot of time and skill to do it well. Libral soon began building with much bigger rocks using heavy machinery to lift them into place. 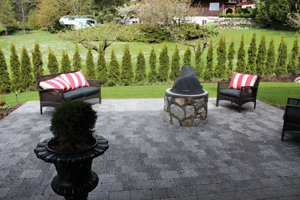 Libral founded Victoria Stonescaping Ltd. in 2010 where where he uses the latest equipment, skilled crews and rock work expertise to work with you to create your landscape masterpiece: bog or small, residential or commercial. His longstanding interest in building better, his innovated style, and careful attention to detail has enabled him to turn an age old building method into a full range of traditional and contemporary designs. For 20 years Libral Furtado has been building and creating landscapes using stone that will last for centuries. Designed by Seriously Creative Design.